This active kids tour Florence is designed to entertain the most energetic of families. Imagine sunbeams shining through the Tuscan cypresses, among Fiesole’s peaceful rolling hills and explore this striking natural environment while climbing up, swinging along and walking, on a tightrope or plank, among the woods grand, imposing trees. 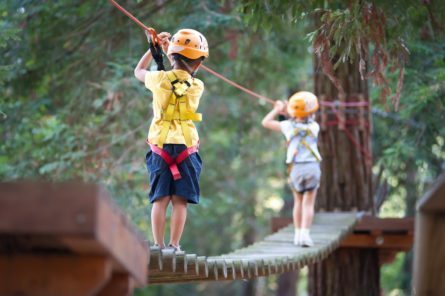 Vincigliata’s amazing Adventure Park offers four challenging routes run among the forest’s trees: at three different heights: two, seven and, yes, ten meters high too! Safely clad in a harness connected to two spring clips and a pulley, test your limits or discover that, here in Vincigliata’s shady woods, there are none! Surrounded by a blissful natural environment and welcoming atmosphere, assisted by the on-site well-trained staff, have a go at this new adventure. Vincigliata’s striking adventure park is suitable for all ages and levels of fitness: the park comprises 4 different routes, especially set up to host all ages and levels.